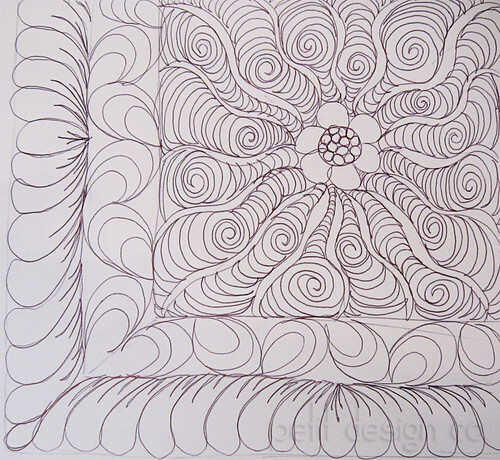 I always practice machine quilting by doodling with pen and paper. It really is true that if you can draw it you can quilt it out. The more you practice your doodles the better your brain will be at telling your hands or machine which way it needs to go. The flower in this doodle is a place holder. It could be a star block, some applique, anything really. I was watching a Linda Taylor video and wanted to try out some of the techniques she was demonstrating. I love the Dr. Seussy feeling of the main back ground fill. I also like the inner border and how easy it was to draw it out. I really need to learn how to think upside down. I've noticed that my designs are wonky anytime I have to do them upside down or from right to left. I guess it all comes down to practice and it's definitely easier to practice on paper than it is to practice on the machine. I can practice on paper anywhere, anytime. Like at the Dr's office, waiting in the car pick up line, at church (he he), in bed etc. You really ought to try doodling too. I find that a 9"x12" pad works best because it's big enough to let you practice drawing bigger. When I first started doodling my doodles were always tiny, but you will get better results if your doodles are closer to the size you would put on a quilt. I love this doodle! It's fun and whimsical. I doodle all the time, but I generally draw teeny tiny quilt blocks. From now on, it's FMQ with a pen. Thanks!